Soma is on a mission to improve life for everyone who drinks water, with sustainable, plant-based filters that make water healthy and delicious, beautiful carafes and pitchers, and the convenient Filters by Mail service. The Soma Pitcher is made of shatter-proof, BPA-free plastic. Designed to look stunning on your table and fit perfectly in your fridge, the pitcher holds 10-cups (80 oz) of crisp, refreshing filtered water. Easy-to-fill and featuring Soma’s unique filter made of coconut shell carbon and plant-based casing that removes chlorine and improves taste. And for every Soma filter purchased, clean drinking water is donated to people in need through Soma’s nonprofit partner, charity: water. 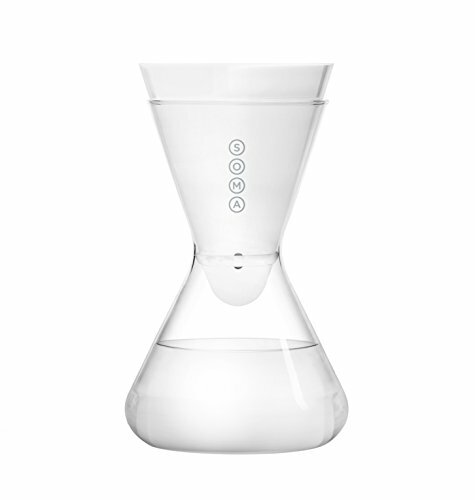 Raise your glass with the Soma water filter.